Container-grown trees often have root-bound balls. If so, soak the root ball in water and loosen the roots. Don’t worry about hurting the tree. We used to recommend cutting and tearing the bound roots, but hydrating them and gently untangling them is a much better method. Ball and burlapped trees don’t need this treatment. Not only do tightly bound roots have great difficulty breaking away and growing into the surrounding soil, but they also can prevent moisture from getting into the inside of the root ball. I have planted many trees using bare root techniques and think you should consider it, although it’s not for everyone and doesn’t work well on trees that have extremely weak root systems. See the Bare Root Information for more helpful advice on this technique. At the least, remove the excess soil that is almost always on the top of the ball and covering the flare. Uncover the true top of the root ball in other words. That includes removing the burlap on top of balled and burlapped trees. Then you can measure the true height of the root ball. When planting bare-rooted plants, it is critical to keep the roots moist during the transportation and planting process. Plant High. Measure the vertical dimension of the root ball. Dig the hole a little less than the vertical height as explained in the last newsletter. Most trees are planted too deeply in the ground. The root flare is part of the trunk, not part of the root system and should be placed above ground. 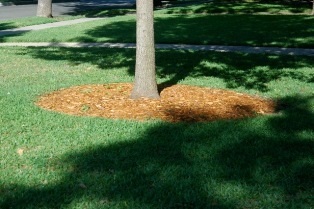 Remove burlap from the sides of balled and burlapped trees after they are set in the hole at the proper height. Remove any nylon or plastic covering or string, since these materials do not decompose and can girdle the trunk and roots as the plant grows. Studies have shown that even wire mesh should be removed to avoid root girdling because wire does not break down very fast. Backfill with only the soil from the hole. No bark, sand, peat moss, compost, foreign soil or fertilizers go into the backfill. The roots need to start growing in the native soil from the beginning. If the backfill is softer than the surrounding soil, a “pot effect” is created in the ground which makes proper watering difficult and encourages roots to circle in the hole. Circling roots can eventually kill the tree. When the hole is dug in solid rock, topsoil from the same area should be used. Some native rock mixed into the backfill is beneficial. If you are planting in soils that have been highly disturbed or damaged, add some mycorrhizal inoculum to the backfill material. Settle the soil with water – don’t tamp. No feet, 2x4s or anything else. Simply let the weight of water settle the soil naturally. Mulch the Top of the Ball. After the backfill is settled and leveled with the surrounding grade, cover the disturbed area with a 1-inch layer of a 50/50 mix of compost and lava sand. Acceptable lava sand is red or black scoria that is the byproduct of lava gravel. Any volcanic rock material can be used if lava sand isn’t available and earthworm casting can substitute for the compost. 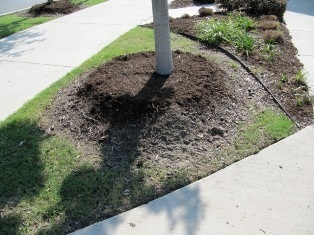 Finally, add a 2-inch or greater layer of shredded tree trimmings – but do not allow mulch to touch the trunk or trunk flare of the tree. Do Not Build Water Dikes. 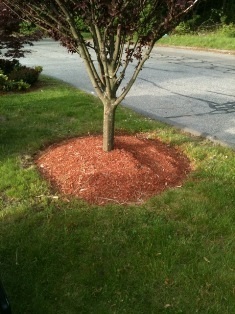 If you planted your trees correctly, these things aren’t necessary. Supposedly water rings form a dish that makes watering more efficient. Problem with that thought process is that when trees are backfilled with the existing native soil and mulch is properly applied on top of the disturbed area, moisture will stay in the root zone for a long time without the cost or inconvenience of the watering rings. If you build water rings around the trees, you have to tear them down at some point or you’ll have “watering bumps” around your trees forever. I am also not a big fan of the green water bags that are being commonly used these days. They shade the bark unnaturally and keep the trunk and flare wet. Plus, they look terrible.